I used to feel guilty when evening would roll around, and I’d realize that the walk onto the front porch for the morning paper was the farthest we’d ventured from the house. My favorite days tend to be those where we hang out in our pajamas until the clocks reaches far into the P.M. portion of the day. Breakfast becomes brunch, and there’s no hurries, no worries. I’m desperately trying to ignore the impending school year, the unwelcome morning rituals that involve my reluctant transformation into a drill sergeant. These lazy days are extremely frugal, queen of green. When you go nowhere, there’s no money spent, no gasoline combusted. And yes, school starts in nine days. But until then, we’ll be hanging out at the house, drawing pictures, playing Scrabble and lounging in our PJ’s. So those of you who measure your days with how much got accomplished, I say to each her own. But I’ll be the one oohing and aahing over her sons’ drawings, and reading library books in the comfort of my living room. Who knows? I might even pencil in a nap. Give it a try, it’s fabulous. “But until then, weâ€™ll be hanging out at the house, drawing pictures, playing Scrabble and lounging in our PJâ€™s. ” Now THAT is a delightful word picture. What a pleasant day! You go for it. Wow, I have been feeling guilty about not going out myself. I am currently unemployed and job hunting, but I have gotten frustrated after sending resumes and all that is left to do is read (even though reading is my favorite activity!) because I don’t feel productive or as if my time is spent in something worthwhile. I have thoroughly enjoyed being alone (though I take time for my boyfriend and see or talk to my mom once a week) and have been rejecting offers to go out with some friends because it requires money. It is funny how society frames us to think we must always be doing something or be with people. It is great to see another person enjoying the simple pleasures. What do you think of superficial, image obsessed, brand obsessed friends. I have an old friend who is this way, and has been for a long time. I care about her because I have known her so long, but we are so different and I do not enjoy spending time with her anymore. I feel guilty to let our friendship go, but I don’t find it stimulating either. 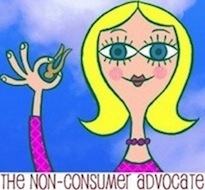 Have you had to let friends go when you embarked on the non-consumerist path? Good job in taking the ole’ saying: “Live each day, day-by-day” to heart…I live in a busy environment, so blocking out the go-go-go mentality isn’t always feasible, but I try when I can. I once mentioned to my doc that some days I stayed in pj’s until late in the afternoon, and he wanted to start me on anti-depressants! I just find it a luxury to be able to do that and my children (now adults) do it when possible, too. Hi my new green chum from across the waves! I love nothing more than reaching midday and us all being in our PJ’s! LOLOL…lazy days are great, but I have to get myself organised – only 3 days and they’re all back at school…eeek…thankfully, it’s only a walk to school. Love your work here – it rings my bell exactly! Alas, I’m a farm manager, no PJs past 5am!